I'm at my family ranch in Southern Utah this weekend and all I can think about is little Mitch. Aside from home, this was his very most favorite place on earth. If asked whether he’d like to go to Disneyland or the ranch, his answer was the ranch every time. Everywhere I look I am confronted with beautiful but terrifyingly vivid memories of him. Every nook brings back visions of days gone bye that play out in my mind like an 8mm film. Each memory exacts an emotional toll that’s exhausting. Mitch was so excited to go here this summer – we talked about it often. The two of us even had plans to make a fort in the back woods and sleep there. Mitch had the place picked out and was so excited to camp with me. Knowing his excitement to be at the ranch, combined with my longing to hold him in my arms … there is a strange heaviness in my heart. 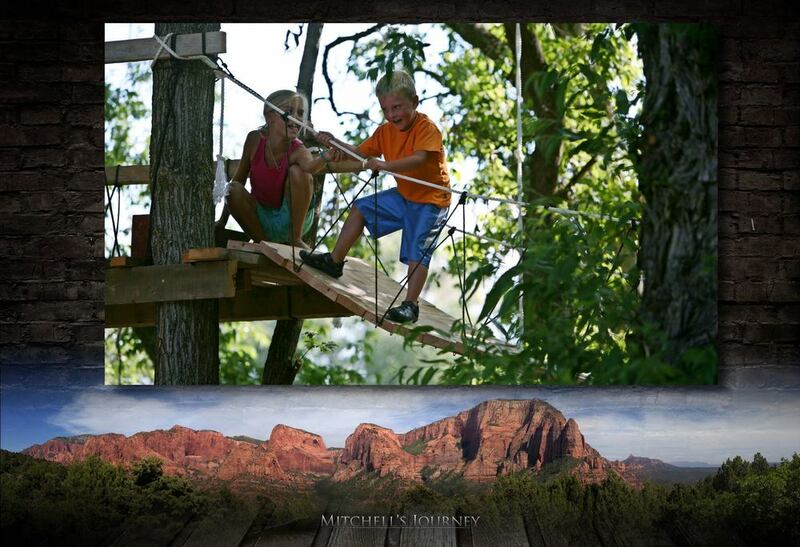 I took this photo a few years ago as Mitch was crossing this bridge at the ranch. At the end of the bridge was his cousin who lovingly encouraged him. A regular child would have run across this with little effort; but for Mitch, who had DMD, this was both difficult and scary. And as much as he wanted to do what the other kids were doing, he was afraid because his muscles were weak and uncoordinated. The risk of injury was very real for him and he knew it. But Mitch did it anyway ... which made his act of courage all the more awesome. If he can do hard things, so can I. Sometimes I get the sense that Mitch, like his cousin in this photo, is waiting on the other side of the bridge of life … unseen … silently cheering my family on. This little boy of mine, whose life was cut so very short, has me wanting to complete my sojourn on this earth with the same bravery, dignity, and honor that he did. And while I stumble about my own journey across, I hope when my legs are weak and soul heavy with sorrow, that I will stop and listen to the quiet heavenly impressions that all is well and to press on and return with honor.